Some recent articles you may find interesting… The second one in particular makes shocking reading. Please check this article out from the local paper! As anticipated the number of families coming forward during the Summer holidays has dropped. I’m just hoping this is because they are visiting friends and relatives who are helping them out. 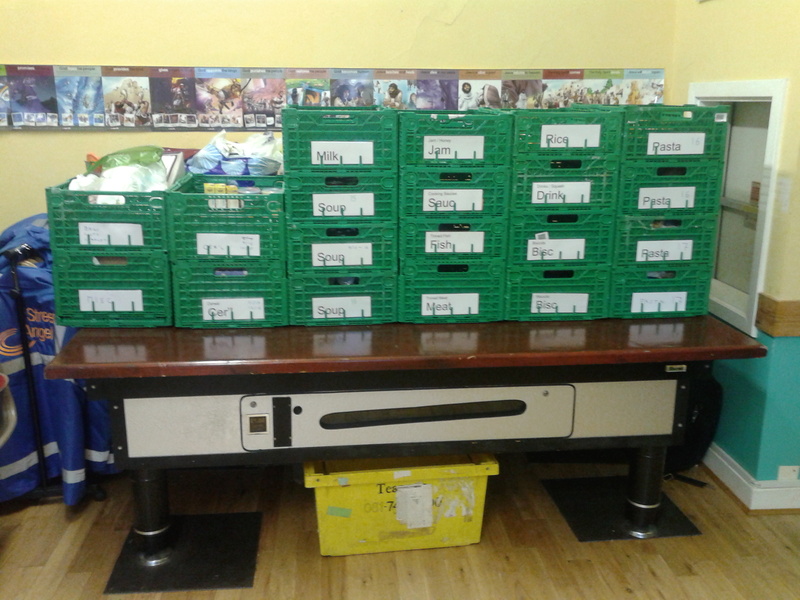 I hadn’t realised until I counted that on a typical week we distribute approximately 800 items of food. If we laid them in a line I wonder how far down the Dedworth Road they would go!! People have been really generous with donations of pasta and cereal and to be honest we now have sufficient to last for a good few months, so we’d appreciate donations of rice, soup, tinned meat, tinned pasta, and desserts. Some people donate non-food items which is very thoughtful but as we are currently having to purchase extra food every week, we really do prefer food items. Whilst we never turn away any donations it would really help us if we had regular donations rather than one-offs. It would make it so much easier to plan. Recently I’ve been having to go out and buy food to supplement our stores so please “spread the word” and encourage your friends and neighbours to donate regularly. You can’t miss the donations cages as you leave the till areas in Waitrose and Tesco, Dedworth. If you work locally would you sound out your employer to see if they’d be prepared to be a collection point? If your employer is a food retailer would you sound out your employer to see if they’d donate any food nearing its “best before” date? I’ll be happy to come along and explain what we do and how it alls works. I want to tell you about a family we recently helped. Mum was feeling really down and unloved and I explained that every person who had donated a food item did so with love and generosity, wanting to help someone who they just didn’t know. I do think it helped her feel better about herself. So a BIG THANK YOU for supporting us. Check out this great idea – have fun and help our stocks in the New Year, after the Christmas rush! Thank you so much to everyone who continues to donate generously and regularly, it is greatly appreciated. Waitrose in Windsor now have a permanent collection point for donations. Their customers have been incredibly generous. In the first 2 months they have donated 540kg of food, worth approximately £1376. 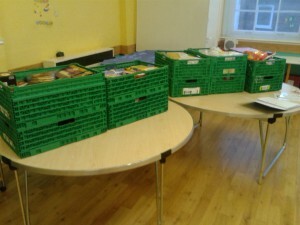 Waitrose have also lent us many food crates and donated hundreds of shopping bags. What a partnership! 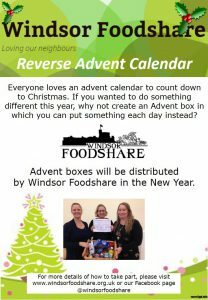 Windsor Foodshare opened a new distribution point in Central Windsor. 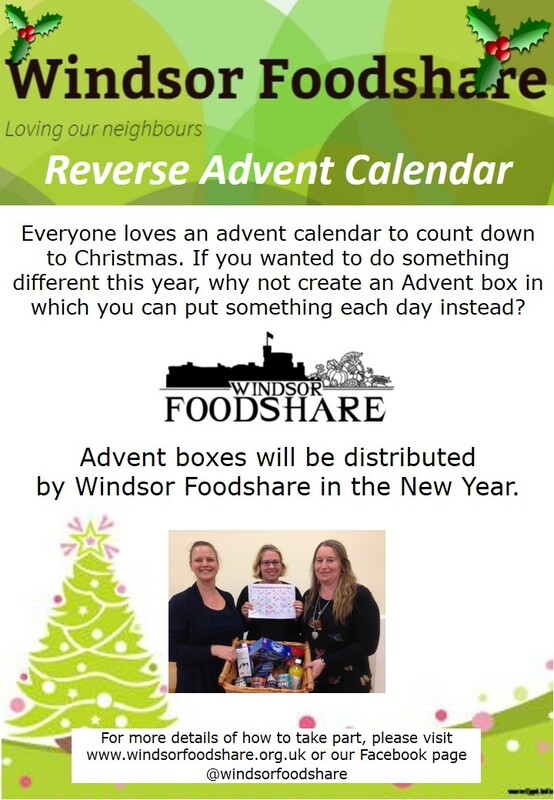 Windsor Foodshare are delighted that Tesco (Dedworth) have agreed to have a permanent collection point in store – you can read about it here. We have also been overwhelmed by the generosity of our community at Tesco’s national collection weekend where 156 boxes of food were collected. This has all been given to our local scheme and shared with our neighbours in Maidenhead.